“If things get really bad, we’ll have to eat beans and rice,” I’ve heard people groan. Well, this isn’t such a terrible fate. It does take a little planning. Most evenings, I spend a few minutes considering what we might eat the next day. Often there is a container of leftovers from something Kelly or I have concocted, and if we don’t have them for lunch, we’ll have them for dinner. If it looks like we’ll be cooking something for dinner the next day, then I consider my beans and grains. Usually I’ll get a feeling of a bean or a grain that I feel like starting with, and then I will decide what else to use. The beans that I cook with the most often are black turtle beans, pintos, Anasazis, lentils, split peas (not really a bean but who cares? ), and garbanzos. In the grain department, my usual choices are rice (short, medium, or long grain brown rice or white Basmati), quinoa, pasta (made from spelt or rice flour because of my wheat allergy), corn, and millet (tends to be dry, best in soups). I also look at my vegetables, to consider what we’ll have and to see if anything needs to be used up. So from these humble ingredients come a wide variety of possibilities. Be sure to cook the beans till they are quite soft, as this enhances both their flavor and their digestibility. Seasoning with herbs and spices adds a lot to the dish. Spices, such as chili powder or curry, can be added early in the cooking process, but herbs should just go in within the last half-hour or so, as their flavors tend to get lost if you cook them too long. Here are three of the dishes I often make from beans, grains, veggies, and flavorings. I make enough for at least two meals for the two of us. Sprouts are good on top of these. This is an all-American dish, as all of the main ingredients are from the New World. Out of season for fresh corn, I would use canned corn in this concoction. Serve it with fresh or bottled salsa. It can be made thick enough to go into tortillas. The quintessential hippie dish, and I’m still happily making it after all these years. I stir-fry the veggies in a large pan – often with ginger and garlic – and then add the tofu near the end. I make the rice by itself. Leftovers usually get mixed up together if the proportions seem about right. Another variation I do sometimes is to cut the tofu into small squares and marinate it in tamari (a.k.a. soy sauce). Then I cook it separately in a different frying pan, till the tamari has mostly evaporated and the tofu is dark brown on the outside. To serve, start with rice in the bottom of the bowl, then pile on the veggies, then the tofu. 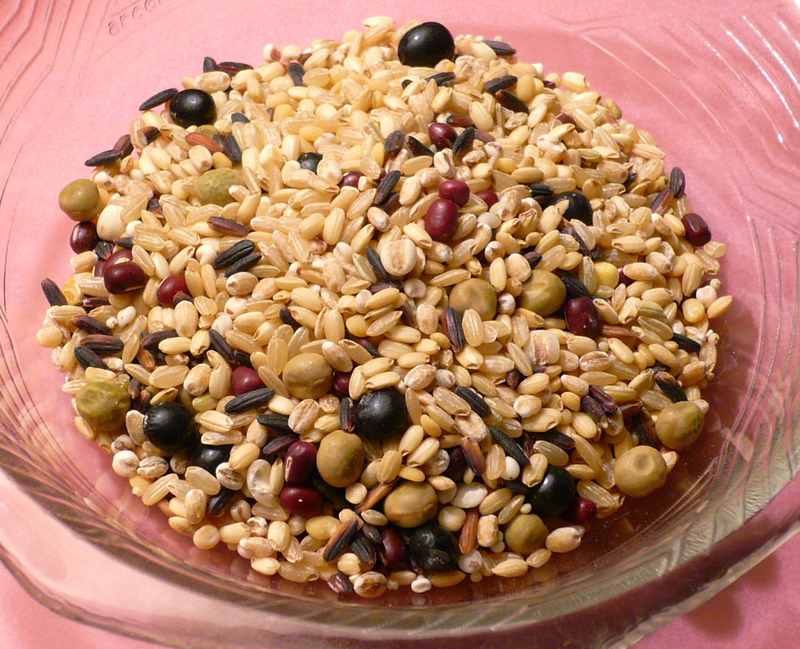 This is good with sesame or sunflower seeds sprinkled on it. Not for people on a low-salt diet! Then I add whatever veggies are on hand (cauliflower is a favorite) plus pre-soaked millet. I usually make a big batch of this soup, starting out with about a cup of dried split peas and about a cup of dried millet. I tend to have a liberal hand with the curry powder, and to balance that, will throw in a handful of raisins or some fresh or dried apple. Because millet has a tendency to absorb seemingly unlimited amounts of water, leftovers of this dish are often thick enough to serve the next day on bread or tortillas.